Cool weather, colorful leaves, and a warm cocktail. What could be better? We are over 35 authors giving away a ton of great ebooks and prizes. Keep reading to find out what they are! Have you joined our event on Facebook yet? Please take a moment to do so and invite your friends. We are using the event page to highlight the books that are being given away on our blogs. We're also having some games you can play to earn additional entries in the giveaways. Come on over so you don't miss out on anything! We have over 35 ebooks to give to our readers! Each blogger is giving away 3-4 of them. You can win one of three right here on my blog. A second divorce and a new baby wasn't the vision Alison Hayes had for her future. Now a single mother with two young boys, she wants to focus on her kids and what's left of her stagnant career. When Detective Johnny Rhay Bennett breezes into her life with his country-boy accent, she wants to run. She doesn't need another man in her life, or another reason to make people talk. But when her worst nightmare becomes a reality, Johnny is the only person who can pull Ali out of her despair, forcing her to stay strong and not give up hope of finding her missing child. Who falls in love after a one-night stand? Johnny Rhay doesn't believe it's possible until it happens to him. With Nashville in his rear-view mirror, he's determined to convince Alison she loves him too, even if it means moving to the West Coast. Ali's not easy, and she's living on just this side of bitter after her divorce, but Johnny doesn't care. He's up for the challenge. At least, he believes he's up for it until baby Micah is stolen right out from under his nose. Now Johnny has to keep it together and get that sweet little boy home safe before his dreams of having a family vanish too. Devan Stowe has only one thing on her mind”"shutting down her father’s child trafficking business. Her determination sets her on a journey to discover her true strength and the one man she was destined to love. In his arms, she’ll learn the meaning of trust, honor, and courage. She will unlock an amazing gift that will free her from her past and open up a future full of magic, faeries and more things than she ever imagined possible. But no good deed goes unpunished, and Devan’s quest may have deadly consequences not only for her, but for those she cares most about. Jill Prescott returned from self-imposed seclusion to help save her best friend Devan’s life. Throwing herself into Devan’s problems and bringing an evil organization to its knees might just be the distraction she needs to keep living without the only man she’s ever loved. Her life changed forever when she was hired to spend a week with Doc Massey. On the day she became a vampire her youthful innocence ended, but Doc’s love rescued her from being consumed by the darkness. The shadow of that former life continues to loom over her, keeping her from realizing her own self-worth. Running from her past only brings her closer to a destiny that is inextricably connected to what she is trying to escape. . .
Every gift has both a reward and a price, because All of it fits. . .
He’s the dependable one. The strong and steadfast one. Still, there’s one woman who has always turned his firm resolve on end. Langston is surprised beyond belief to find Kristana again, and this time without a husband. Has fate finally given them the chance to be together? Kristana can’t escape her intense attraction for the strange giant Langston, but the murmuring voices in her head are threatening to drive her mad. Can she find a way to trade one torment for another and thereby find true love? Gerry Hinton thought she had the perfect career as an operative for the Company. Her next assignment should have been another "mission accomplished", but hell was delivering hand baskets that day. When a little girl gives a mysterious silver box to Gerry, her world self-destructs. Suddenly under constant mental attacks, the only person who can save her is her partner, Nicky--but nothing comes without a cost. Secrets buried deep in the past begin to rise, threatening everything she holds dear. Viktor has battled the darkness his entire vampire existence. His wife and the life they made together manage to keep him from the brink of despair, but it’s always near the surface. A strange and dark encounter at a party unleashes his repressed past, overwhelming him with memories of his cruel maker and lost love. His sanity is challenged when a mysterious dhampir arrives on his doorstep with information that will cause him to question everything he thought he knew. Enrico Lucchesi never wanted anything to do with the Mafia. But when his brothers were murdered, he accepted that he would someday be the next don. However, he doesn't accept that he must marry the daughter of the man who killed them. Enrico will never trust an Andretti, never mind love one. The Andrettis are up to something with their so-called "truce"--and Enrico must avenge his siblings. But will his dark secret spell the end of his vengeance--and possibly the Lucchesis? After Antonella Andretti's father tries to destroy the Lucchesis, she persuades him that an alliance--achieved by her marriage to Enrico, the "golden boy" she's loved from afar--would be in everyone's best interests. As her wedding day approaches, people close to her father start dying, and her fiancé's behavior is suspect. 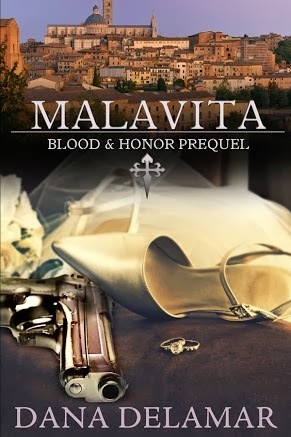 When she learns Enrico's true feelings about her--and what her father's actual plans are--will Antonella damn their families to eternal war, or will she broker a peace that might destroy her heart? Here's how the book giveaway works: There are eleven of us who are featuring the giveaway books on our blogs. The books will be won individually so your chances of winning are very high. Be sure to go to all eleven blogs to maximize your odds. To enter: Fill out the Rafflecopter below. The more actions you do, the more entries you get! Now for the grand prize. We are also giving away a $175 Amazon gift card! a Rafflecopter giveaway What Now? 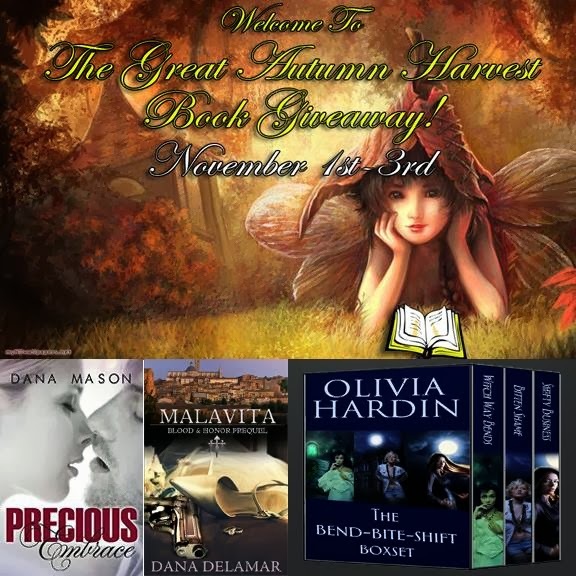 For more great ebooks to win, please return to the Great Autumn Harvest Book Giveaway Event page. We'll be highlighting more ebooks, and the blogs where you can go to win them. Definitely the whole Bend-Bite-Shift Saga for me..
What an awesome event! Books from just about every genre! Thanks for the contest! Logan's Acadian Wolves by Kym Grosso. Loved the first book. Thanks for the giveaway. I have a lot of the books already, so maybe... Whisper Cape? Can I say all of them? hehehe Actually, I'd be excited to win any of the books being offered. And if I won the giftcard the books I get with it be the books on my wish list and alot that I seen at The Great Autumn Harvest Book Giveaway! Nov. 1st - 3rd so many great books!!!!! Looking forward to the whole Bend -Bite -Shift Saga. If I won the gift card I would definitely be getting some shifter stories especially those .99 cent ones that have been advertised in all of my new blog posts that I started following. The Bend Bite Shift Saga looks fantastic. They all look great! Thank you for the incredible giveaway! So many books! I plan to get as many books as I can with the gift card as I can! I would be excited to win any of the books!